Entries open today for the BM Ride, a new sportive taking place alongside Brighton Marathon on Sunday 14 April 2019. Held on fully closed roads, the 50km sportive will follow the entire Brighton Marathon course including Brighton city centre and the seafront. Riders will not have to face Ditchling Beacon - the famous local South Downs climb that has featured in everything from the annual London-Brighton charity ride to the Tour de France. The originally published route included a couple of sharp climbs in Ovingdean and Woodingdean, however the organisers announced today that this section has had to be removed from the course. Cycle the Brighton Marathon course with the BM Ride sportive this April. 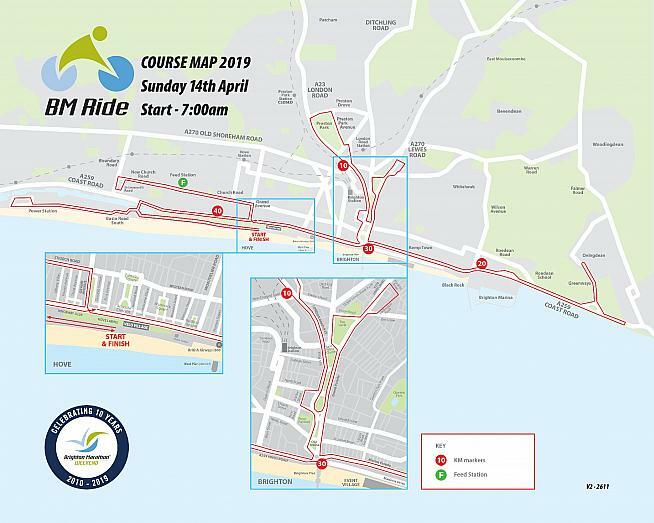 Cyclists will set off at 7:00am, ahead of the marathon (so no drafting behind joggers in giant Mr Blobby outfits) and should be back on the seafront in time to cheer on the runners. Entries for the BM Ride open at 10:00am on Thursday 31 January. Just 1000 places are available for this first edition of the ride, with entry costing £40. To take part, visit the event website at www.brightonmarathonweekend.co.uk/events/bm-ride.